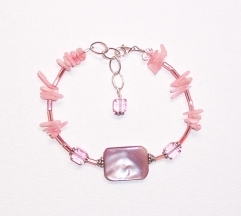 Inspired by spring, I wanted to make something in beautiful coral beads that wouldn't break the bank. 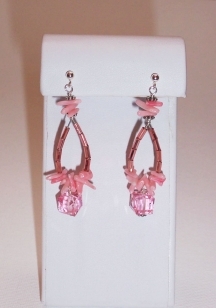 So, I came up with this design, and separated bunches of luscious pink branch coral beads with inexpensive bugle beads. 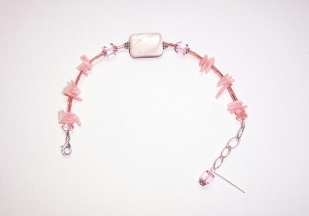 The focal of the bracelet is an oblong luminous shell bead which is pink on one side, and white on the other. I offset that with two light rose Swarovski crystal beads, and of course added one more as a "dangly" on the extender chain as a finishing touch to this very pretty bracelet. 1 clasp of your choice. For this bracelet I used a sterling silver lobster claw clasp. Tie a knot on one end of the wire, or place some tape over the end, and string all of your beads onto the wire. 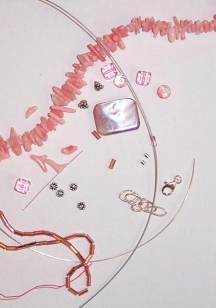 Check the length and overall design and make adjustments by adding, removing, or re-positioning beads until you are happy with the look of the bracelet. You can do this first on a bead design board if you prefer, but I always like to wrap a bracelet around my wrist just to check the look and fit. Untie your knot or remove the tape. 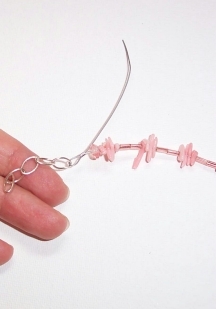 Slide a crimp bead onto the end of wire, and thread the wire through the loop on the clasp, and back through your crimp bead. Crimp the bead flat or use a crimping tool to close the crimp. Follow the How to Use Crimp Beads instructions if you are not familiar with this technique. Do the same thing on the other end to attach the extender chain (if you are using one). I always add a little detail by attaching a dangly bead to the end of the extender chain. It just looks so nice sparking on the wrist. 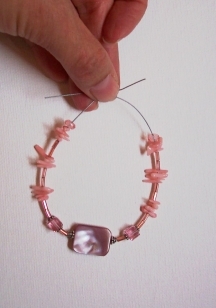 Slide a Bali daisy spacer bead and a crystal onto a headpin, and attach it with a loop. That's it! 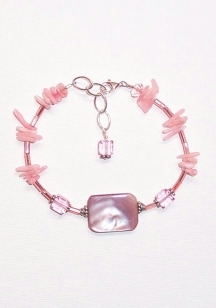 Your beautiful bracelet is ready to wear or give to someone as a special gift. Try these matching earrings for a complete set!